This summer it was so humid, and my salt refused to come out of the shaker. So I made a little salt pot. This little pot came from a free flea market that our town held. I was storing junk jewelry in it, but decided to put it to use in the kitchen. 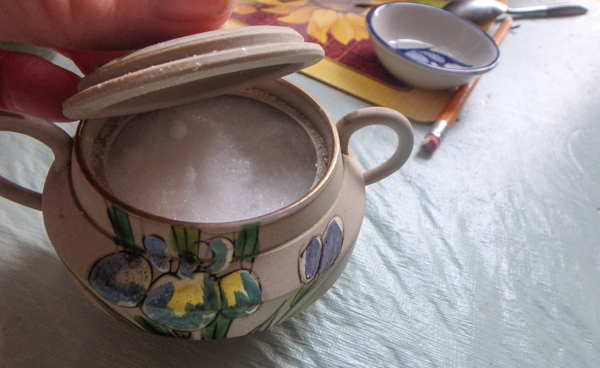 I did eventually put rice in my salt shaker, but I have really been enjoying using my little salt pot. It's not as big as it looks, it's tiny, about 3 inch diameter. All I do is take off the lid and grab a pinch. I have created this Dinner Index page, so you will be able to easily navigate through the different recipe pages. You will find some traditional recipes, that are simple to make, and I have tried to add only recipes that have the fewest of ingredients. Kitchen Tip: The first thing you should do when you go in the kitchen is make a sink full of hot soapy water, and as you use your cooking utensils, wash them. Cooking Tip: For quick and handy seasoning while cooking, keep on hand a large shaker containing six parts of salt and one part of pepper. Also you can make your own seasoned salt. Easy Beef Recipes - Sliced beef and round steak page. Broccoli Casseroles - Large variety, easy to make. Chicken Recipes - How to fry chicken and use leftover chicken. Eggplant Recipes - What to do with eggplant. How to Make Egg Rolls - My own recipe, had it for years. Ground Beef Recipes - Stuffed Green Peppers and other miscellaneous recipes. KrautBurgers - Krautburgers are one of our favorites! Meatloaf Recipes - From basic to fancy meatloaf. Potato Recipes - Mashed, baked, and twice baked, scalloped too. Fried Potato Recipes - Different ways to fry potatoes, make hash browns. Spaghetti and Sauce - Spagetti sauce from scratch, homemade Ziti and Lasagna. Taco Recipes - Favorites like taco salad, taco casserole etc. 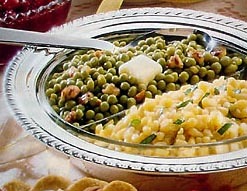 Tuna Casserole Recipes - Different types of recipes for tuna. Zucchini Recipes - Try 17 different Zucchini recipes. Wild Game Recipes - a new page with all the wild game recipes on it. Turkey Dinner - How to organize a turkey dinner. Thanksgiving Timeline - Thanksgiving for a crowd. Cranberry Recipes - All of the cranberry recipes. Relishes too. Stuffing Recipes - Some simple recipes for stuffing.